One of cornerstones of every book I have written involves a moment when I was in the second grade . . . the best three years of my life. She was discussing balance in life. She warned that some of us would work too hard in life. This was long before the word workaholic was coined. Others would choose to rest too much or engage in slothful behavior and never get out of mom’s basement. And some, and we all know someone, would choose a path of pure play. Being a nun, a term derived from the feminine of monk for those women who are in communities of chastity, obedience and poverty, she never mentioned praying too much. For those of you who don’t pray or meditate, this can also be alone time or enjoying nature and art. That would NOT include binge watching Netflix. For whatever reason, this compass stuck with me. It’s my foundational vision of life. 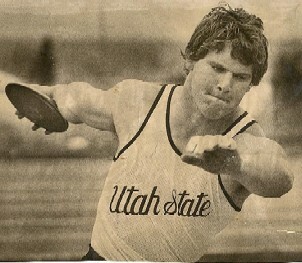 In the 1990s, I had a full-time job and I was training as a national level thrower. I also was the father of two girls and my wife traveled every week. On my 40th birthday, I came home to a hot tub. If you work harder, plan to rest harder. Soon, Tiffini could be found every morning well before the rest of us woke up, sitting in the hot tub with a cup of coffee. I swear our daughters survived because, well, Mommy needed alone time. I noticed that if I plan to increase all four points in the compass, I can handle almost anything in life. 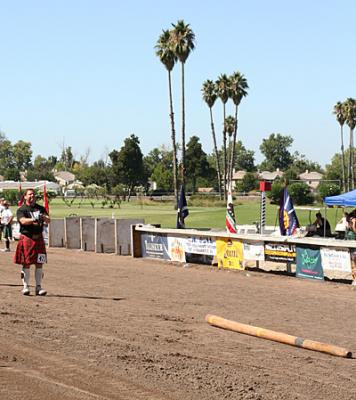 I actually improved as a discus thrower when I took on a new sport, Highland Games, because it was fun. It was play. Somehow drinking Scotch and eating ribs between rounds of throwing appealed to me at some level. When we train in our IC, we laugh, work, rest, learn, clean up, eat and explore. We are truly human. But, there are also times where I need to take my dog for a walk and just listen to nature. 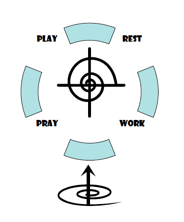 We need both play and pray, work and rest; we need all four points of Sister’s compass. The 30/30 for 30 workout I’ve been writing about on OTP seems to naturally balance this. I have been a fan of group workouts since 1971 when my teachers at Southwood Junior High School had us train in cohorts of four people. Rest periods were based simply on “your turn.” While one of us lifted, the other three spotted and we just got going in rounds for the whole workout. For more information, here you go. “I go/you go” is the foundation of most partner training programs. You rest while your partner works. I’ve done it with Olympic lifting and basic bodybuilding and most readers have the same experiences. But, I also insist on the other three points of the compass. My best athletes understood that greatness comes from the hours of training alone. The meditative act of throwing the discus for hours without a single other voice interrupting the flow is truly contemplative. I am sure every swimmer, cyclist and runner understands this too. But, we also have fun. Challenges are “Work/Play.” I have dozens of them and some are very difficult, like squatting with your bodyweight on your back for 50 reps.
It’s fun watching someone else do that. This, of course, began the template for the most successful competitive run of my athletic career. Training in the weightroom for as little as 15 minutes a day allowed me to break records in the discus, Highland Games, Olympic lifting and Weight Pentathlon. Of course, few followed this simple formula and I have written a book, several blogs and answered hundreds of questions about it. I addressed all of this in this blog. I have given people my journals to help them understand the 40 days. It’s not complicated. 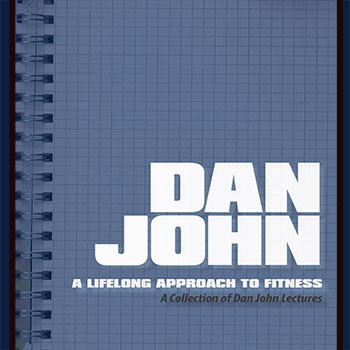 I have my workouts in the book and on various forums, but it really just comes down to picking the lifts and going to work. The “stroke” for each movement is about the same and each is simple enough to do daily. In addition, the Ab Wheel is the perfect complement to these movements. Then, 30/30 for 30 Minutes. Mondays and Fridays focus on upper body hypertrophy moves mixed with cardio machines, Tuesday and Thursday focus on “buns” work mixed with either kettlebell swings or snatches, and Wednesday is “depends,” either a ruck or an easy tonic 30/30 with TRX movements and rehab work. Cool Down: Tim Anderson’s Original Strength (OS) work. It’s that simple. Tim’s movements are mobility, flexibility, groundwork and just feel good work. You will be doing KB Snatches with one hand for an additional round. We don’t find an issue with this, but you could switch starting sides next time to balance it out. Frankly, it’s not a big deal and I probably wouldn’t remember to do it anyway. Walk with loaded pack for up to 45 minutes with some faster paced walk sprinkled in at random times. I use a 40-pound vest. Sister Maria Assumpta’s compass idea has impacted every aspect of my personal and professional life. As I wander deeper into the 30/30 protocol, I feel better, look better and perform better in my “real” life. It’s all about the balance. Work, Rest, Pray, Play. Jason C. Brown's workshop on play is a popular new talk on the Perform Better Summit circuit, and in this talk he explains the foundation of his lecture.